What do you mean I've been absent? Just another case of a life being consumed by an mmorpg. Shake your fist at WoW in vain. Now that I have been playing the Lich King beta, my interest is rapidly waning (atleast until the expansion comes out... el oh el). Btw: Mookie loves having things placed on her head. 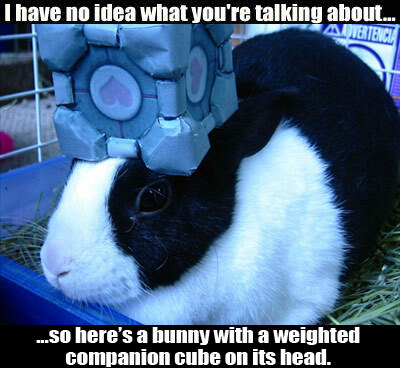 I can assure you the weighted companion cube caused her no harm. She claims it spoke to her, but I'm skeptical.